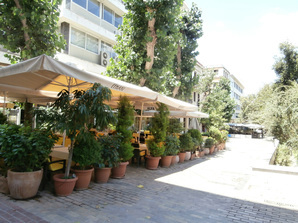 The square is defined by Vassileos Georgiou A' Street, Othonos Street, Filellinon Street and Amalias Avenue. The eastern side of the square is at a higher level than the western, and is dominated by a set of marble steps leading to Amalias Avenue; beneath these lies the Syntagma Metro station. The stairs emerge below between a pair of outdoor cafes, and are a popular city-center gathering place. Syntagma also includes two green areas to the north and south, planted with shade trees, while in the center of the square a large water fountain traditionally hosts the frequently sighted Syntagma pigeons, along with heat-tormented visitors during the summer. The Greek Parliament is immediately across Amalias Avenue to the east, and surrounded by the extensive National Gardens, which are open to the public; the Parliament itself is not. 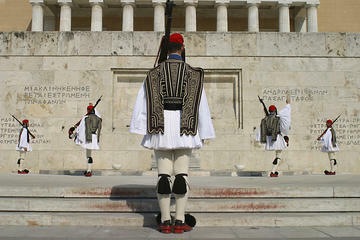 Every hour, the changing of the guard ceremony, performed by the Presidential Guard (the Evzones) in their formal traditional uniform in kilts, takes place in front of the Tomb of the Unknown Soldier, a monument that pays tribute to those fallen in defense of the homeland, on the area between the square and Parliament building. On Sundays and official holidays, the ceremonial changing of the guard occurs with an army band and the majority of the 120 Evzones present at 11 am. 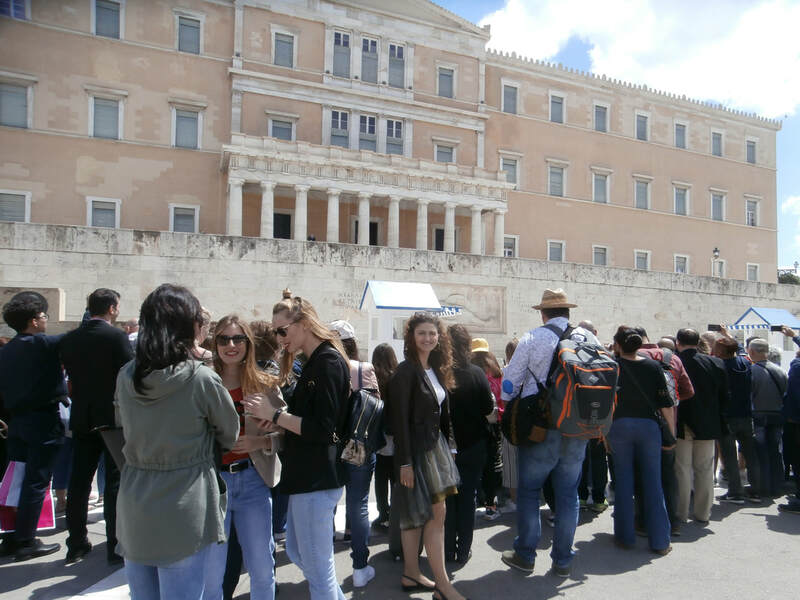 Locals and tourists alike gather to witness the change of the guard ceremony at Syntagma Square, in front of the Parliament. Grande Bretagne, a Luxury Collection Hotel, boasts luxurious rooms and stunning city views from its magnificent rooftop terrace. The lavish rooms are appointed with the finest furnishings. The marble bathrooms feature a vanity counter, separate bathtub, and shower. Some rooms have balconies facing the Acropolis, others the daily changing of the guard at the parliament building. WiFi is offered throughout. From the Roof Garden Restaurant you can see the original Olympic Stadium as you dive into the pool; the Parthenon atop the Acropolis as you sample the finest Mediterranean cuisine. The hotel Spa offers a thermal suite, complete with herbal bath, grotto, ice fountain, couples retreat and indoor pool. King George, also a Luxury Collection Hotel, featuring a neoclassical facade, also boasts a prime location on Syntagma Square. Luxuriously decorated with hand-picked items and chandeliers, all rooms open to a balcony or window facing the Acropolis or the tranquil inner courtyard. Bathrobes, slippers and free toiletries stock the bathroom. A signature restaurant, fitness center and meeting facilities are included. Enjoying panoramic views of the Athens City from the seventh floor, Tudor Hall Restaurant serves gourmet and Greek dishes. Guests can relax with a drink or cocktail from the on-site bar. ​"The Royal Palace of Athens", 1841, by August Ferdinand Stademann. The neighborhoods of Plaka, Monastiraki, Psiri and Kolonaki are all within short walking distance, and most of the famous sites of ancient Athens are nearby, including the Acropolis, the Theater of Dionyssos, Areos Pagus, the Ancient (market) Agora of Athens, Hadrian's Library, the Tower of the Winds, the Roman Agora, the Choragic Monument of Lysicrates, the Arch of Hadrian, the Temple of Olympian Zeus, the Pnyx, the Philopappos Monument on the Hill of the Nymphs, Kerameikos, and Lycabettus Hill. Several historic Byzantine-era churches also dot the area. 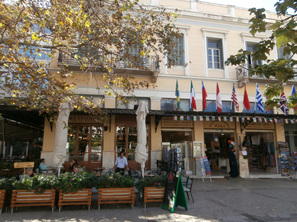 On the south side of Syntagma Square, Ermou Street is probably the busiest single commercial street of Athens, and indeed Greece. In addition, the area of Kolonaki nearby is a thriving upscale commercial area with a multitude of shops on every single area of fashion. - Homemade Marmalade, using fine indigenous ingredients, elegantly packaged. Lemon, Bergamot, Plum & Pomegranate, Mandarin. - Indigenous Greek Honey from Fir Tree, Orange Blossom or varieties of Forest Trees. Extra-Virgin Olive Oil and Kalamata Aged Balsamic Vinegar, to satisfy the highest expectations of the most discerning taste buds. Discover what makes Athens so unique on this 3-hour tour led by a local guide. Dive into the Greek capital’s storied history at Syntagma Square, where you’ll see the impressive Changing of the Guard ceremony. Walk the perimeter of the Acropolis of Athens, a UNESCO World Heritage site; pass through the Ancient Agora of Athens; and see the Panathenaic Olympic Stadium. Then, get a taste of modern life from a local’s point of view in Plaka — or Athens Old Town — and Kolonaki. Numbers limited to 12, ensuring a small-group experience.